A Knoxville, Tennessee organization that helped test the first medical drone delivery approved by the U.S. Federal Aviation Authority (FAA) in Virginia last year, is now looking to deploy medical delivery drones in remote areas of Haiti, the Philippines, and Guyana, South America. “The Guyana government is very interested in this possibility. I think what they’re doing is they’re waiting to see what the … FAA is doing,” said Stan Brock, President and Founder of Remote Area Medical (RAM), an organization that provides free health care to people in need. RAM has been operating for years in Guyana, near Brazil’s northern border. The group maintains an airplane there to pick up people in medical distress from villages that are days away from the nearest doctor and fly them to a hospital. The government of the Philippines, a nation of more than 7,000 islands, is also “very interested in the delivery of medicine by drone” and has developed a lengthy protocol for their use. Brock said RAM is planning to deploy an aircraft there to provide emergency medical pickup at the islands. Brock predicts that people will come to rely heavily on drones in the future for deliveries to remote regions. But he cautioned that the current generation of drones has range and lift limitations, not to mention that those operating in the United States, for example, can only fly within their operators’ visual range, according to FAA regulations. The new aerial vehicles still have to be developed and operated in compliance with current government regulations. Last July’s drone experiment in Wise County, in southwest Virginia, was carefully orchestrated and coordinated with the FAA. The test, a collaboration between Wise county, RAM, NASA, Virginia Tech University and drone maker Flirtey, had a remotely-controlled drone pick up a 10-pound package of medical supplies and then deliver it to a RAM medical clinic some 30 miles away. Since 2013, Flirtey’s drones have delivered textbooks in Australia, first aid kits and two-way radios to land search and rescue operations in New Zealand and, more recently, medical supplies to the RAM facility in the United States. And it’s not the only one. 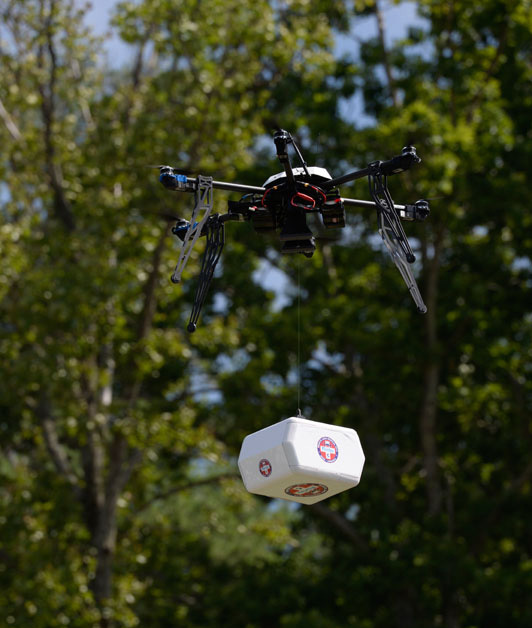 California’s Matternet, a firm that builds aerial vehicles and hopes to make a difference, has also tested a drone-based delivery network in the Himalayas, Haiti and the Dominican Republic to deliver supplies and specimens to remote and otherwise inaccessible regions.